In a bowl, combine the lime juice, garlic, salt, pepper, ginger, celery, onion and yellow chili pepper paste. Add-in five ice cubes and let sit for five minutes. Strain the mixture and pour over two plates equally. Cut the tuna into slices and place the strips into the ceviche sauce (on the plates.) Dress with a slight squeeze of lime. Peel the sweet potato and cut into slices, about 1/2-inch. thick. Place a pair of slices in the center of each plate. Garnish both servings with the diced bell pepper and chopped cilantro. Finish off with a few drops of sesame seed oil over each slice of tuna, and serve immediately. 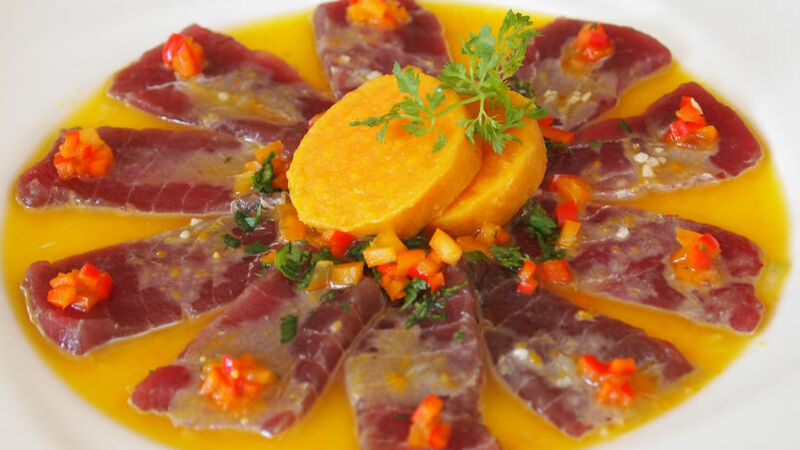 You can serve the ceviche with slices of fried yucac (cassava) in place of the cooked sweet potato. A little seaweed salad in the center of the dish is a great way to add color and an extra toquecito of flavor. Tuna ceviche is one of the most succulent, yet delicate ceviches you can prepare. The bright red meat of this fish begins to turn grey after coming in contact with the acid in the lime juice. But this, you can imagine, is not an obstacle for enjoying this delicioso dish anytime. As soon as you have everything in place, it will only take a few minutes before this unforgettable ceviche is on your table. Of all the foods served raw, tuna is one of the favorites. We can sometimes get confused thinking that tuna has to be served ‘as-is’ from the can, but the truth is: raw is better! There’s no better proof than the spectacular Japanese dishes that use only the most carefully selected tuna; restaurant owners will sometimes pay incredible amounts of money to get the finest tuna available. The type of cut this recipe uses is similar to another Peruvian dish called ‘tiradito,’ which is known for its long, thin slices of fish. The two differ though in the dressing of the fish, where this preparation uses the famous ceviche marinade. If you’ve never tried raw tuna, don’t wait any longer; this ceviche is the best way to start.